IMPORTANT ANNOUNCEMENT: Before you can start working and be put on payroll, you must be able to complete the I9 form. As part of the I9 form, you must be able to provide the original document (no faxes or copies) of 2 forms on the List Of Acceptable Documents I9 form (pdf). You must provide the original document of one item on LIST A OR LIST B AND one item from LIST C. It is your choice of which document you present. 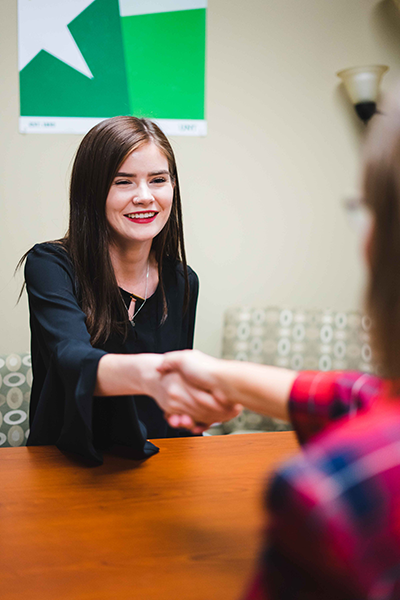 All positions are posted on the Eagle Careers website, powered by Handshake, for UNT students and alumni. The Career Center lists on-campus employment openings in areas, such as Recreational Sports, Union, Libraries, Cafeterias, Residence Halls, Academic Offices, Computer Labs and Student Affairs Offices, etc. Departments at UNT make a special effort to hire currently enrolled students. More than 4,500 students are employed on campus. Often departments are willing to arrange a student's work schedule around their class schedule. College Work Study jobs are those that are partially funded by the state or federal government. College Work Study is a "need-based" aid and the student is awarded a maximum amount of money to earn. To be awarded College Work Study, a student must apply for financial aid through the FAFSA and indicate his/her preference for College Work Study on the FAFSA form. In order to apply for a college work study position, students must have received a college work-study award through the Financial Aid Office. Regular Hourly positions are open to all UNT students. Students not qualified for Financial Aid can apply for these positions. General student employees should either be full-time students at UNT or should show evidence that they are actively pursuing academic work leading to a degree or certification. A continuing student who has not enrolled in the current or most recent long semester (Fall/Spring), must resume regular enrollment in the next long semester (Fall/Spring) to continue general student employment. Click on Student Login, enter your EUID and password. Complete your profile and upload your resume. Go here to access the Student Employment Application. Save the document to your computer, fill out the application, and then save it again. To search for positions, click on the 'Jobs" tab at the top of the page. Under the Job Type, choose On Campus Student Employment. Work Study jobs will be indicated in the job title and/ or in the job description. Click on the Job Title to see more information about each position. The department will then have your application and resume. Sometimes it can take up to two weeks before you get a response from an on-campus employer. The department will contact you, if they are interested in setting up an interview. All positions will require a Resume and a Student Employment Application. Some positions will require other documents such as a cover letter, Financial Aid Award Letter, a Class Schedule, and other job-specific documents. For assistance with your resume, cover letter, or interviewing please refer to the resources on our website or in the Career Center. You may also schedule an appointment in Handshake to meet with a Career Development Specialist. Apply for multiple job postings (minimum of 20-25 jobs). Follow up after applying (3-5 days afterward). Search for jobs daily and respond quickly to positions that you are interested in (even check on the website a couple times during the day). Make sure to fill out the student application completely and upload a resume. (follow application procedures). Have a Career Center Development Specialist look at your resume. Practice Interviewing in the Career Center. Dress professionally for the interview. If you go in person to the department, show enthusiasm and friendliness to everyone in the office. Show the department as much availability as possible in your schedule. It is helpful for students to schedule classes to accommodate a consistent work schedule. Creating blocks of time for work, such as 8:00am-12:00pm or 1:00-5:00pm, is best, as many departments prefer students to work for a minimum three-hour block of time. Off-campus opportunities are also available for UNT students. These opportunities are also posted in Handshake. You may use different filters to narrow your search such as Location, Keyword, Job Type, etc. We hold off-campus job fairs in both fall and spring semester. For more information, see the Events tab in Handshake. C.A.S.A. (Creating A Service Attitude) is a training program designed to help on-campus student employees improve their customer service skills. Soft Skills for the Workplace is a training that covers some basic soft skills such as phone etiquette, written correspondence, etc. to student employees. Students may sign up for CASA and Soft Skills in Handshake. Student employees should be made to feel that they can always go to their supervisor with work-related problems. The first step for a student employee with a complaint in most cases ought to be the immediate supervisor. If student employees feel that they cannot discuss a matter with their immediate supervisor, student employees should take their concerns to his/her supervisor. The Career Center is another resource for student employees with complaints. The Career Center will talk with the student and give him/her University policy information and resources. In cases where the Career Center believes that discrimination and/or unfair treatment has occurred, the student will be advised to contact the Office of Equity and Diversity for further investigation.